In the annals of dysfunctional families, the Chisholm’s are working their way to the top. Drug abuse, an unwed mother with multiple fathers, and the questionable cash flow for the ‘pretty one’. All this from a seemingly normal, two parent middle class family. But were the choices truly made of their free will? Bad choices are a Chisholm family trait, one that confounds the youngest child, Ellie, who’s trying to separate herself by making smart decisions. And falling for Oscar Jeffreys, the hottest guy at school, would be number one on the list of Chisholm family disasters. Yet the crazy part is it’s not a one sided attraction. Somehow Ellie has caught Oscar Jeffreys’ eye. Sure she could see the barriers between them. Race, age, popularity. They were at opposite ends of the spectrum. But a demon set to destroy her family? She can’t see that. Oscar provides security and acceptance Ellie never imagined she deserved. As the passion of first love grows, Ellie honestly believes she has a chance to beat the odds and live a happy, normal life. Then her world collapses around her. With the help of a guardian angel, Ellie learns of a world that has unknowingly surrounded her for years. And she’ll have to find strength buried deep inside to save not only her future, but flush out and stop the demon in her midst. And Ellie will have to learn that sometimes the hardest lesson about growing up is accepting that you’re worth more. I’m not sure if I read a different blurb on this book, or just forgot what it was about before I got around to reading it, but this book completely blindsided me–in a weirdly good way. I had no idea that the supernatural parts were coming…this novel actually kind of read like two different books after the truth came out! I was enjoying all of it though. Ellie is alright, a little neurotic, moody, but she’s barely sixteen so that’s to be expected. Oscar is amazing. He’s extremely patient and understanding with Ellie, and with her family background she has a lot to be cautious about. The chemistry between Ellie and Oscar is sweet but hot when the sparks start to fly. Ellie is helped along in her journey with the supernatural by her best friend, Kelly. Kelly is really cool and helps keep Ellie grounded and sane, which she definitely needs. I loved watching their interactions, as there were quite a few funny moments when they were together. The second half of the book rolled along a lot quicker than the first, and although there were times I felt like the author was rambling, I liked the storyline a lot. This is a fun take on an angels versus demons tale, with plenty of romance thrown in. The ending was rather abrupt, but I think that there’s so much more ahead for Oscar and Ellie! Michel graduated with a bachelor degree in History and Political Science. She writes young adult and adult paranormal romance as well as contemporary romance. Michel will be awarding a butterfly gift basket to one randomly drawn commenter and a butterfly necklace to a second randomly drawn commenter. Follow the tour and comment; the more you comment, the better your chances of winning. 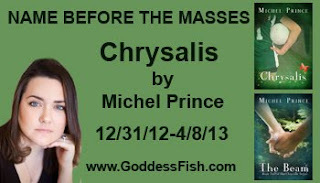 The tour dates can be found here: http://goddessfishpromotions.blogspot.com/2012/11/nbtm-chrysalis-by-michel-prince.html. Posted on March 18, 2013, in book tour, books, free, Giveaway, reading, review. Bookmark the permalink. 7 Comments. Thank you for hosting and taking the time to review. great review. I think this is going to be a really good book to read. It sounds fascinating. This looks like a fun read! I do like angels and demons.